NIA CHARLESTOWN NEVIS (MAY 26, 2016) – Farmers on Nevis are regarding the Ministry of Agriculture’s launch of the Farmers Identification Card initiative as a valuable asset to them. That view was expressed by Mc Levon Tross, owner of A-1 Farms in Gingerland on behalf of the farmers who received the card at a ceremony to launch the card at the Red Cross conference room on Tuesday May 24, 2016. “The ID cards…is a very valuable asset to every farmer on Nevis, it basically shows that you are sanctioned by the Department and the Ministry of Agriculture and that you are a professional in your own discipline. 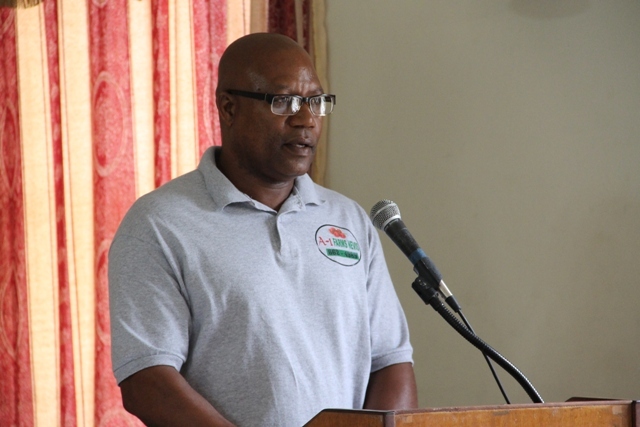 “This initiative is…well received by a wide cross-section of the farmers…we at the Nevis Growers Association…see this as an initiative to solidify and make every farmer respected, bonafide and have some place in society. It’s long in coming but…from this day going forward, we could look at it as being a group that is well respected in our society,” he said. Tross believes that the new initiative could also minimize theft and took the opportunity to encourage business owners to patronize the registered farmers. “I am using this opportunity…to appeal to merchants…to make sure that you are buying produce and products from bonafide farmers. That way we could eliminate a lot of theft,” he said. Tross congratulated the Ministry and the Department of Agriculture for the initiative and encouraged farmers on the island to embrace it. “We are hoping that this time, going forward, would be a sign of good things to come where farmers are concerned,” he said. The Department of Agriculture, launched the Farmers’ Identification Card as part of the Department’s Agriculture’s annual Awareness Month during the month of May. The theme for this year is “Adapting to climate change to achieve greater food security”.